I have been meaning to make fior di latte gelato for quite some time – it is one of the most delicate flavoured gelatos you can find. Sure, normally I am a pistacchio gelato lover through and through but given that I have had my fair share of this over the past few years (most notably in Noto in Sicily, as close to where the famous Pistacchi di Bronte come from as I have managed so far), I have started to branch out – my favourite Roman gelateria, Fatamorgana, offers all sorts of mouth-watering flavours, a firm favourite being ricotta con agrumi (ricotta gelato mixed with citrus fruit zest) … but sometimes, you just want a classic, something that isn’t too sweet, something that doesn’t challenge your taste buds but promises simple pleasures, the ice cream equivalent of a down comforter, and that is where fior di latte gelato steps into the picture. It is one of the few gelato flavours that does not rely on an egg custard base, instead it is a simple mix of sweetened milk and cream. Once frozen, it has a delicate milky flavour – perfect on its own yet also a blank canvas if you want to pair it with other flavours. Making fior di latte gelato myself became a no brainer once I realised how simple it is to make. But, I did not stop there, I wanted a swirl in my gelato and decided on a fennel-infused honey to have something that would contrast nicely with the milkiness of the gelato – and, for a bit of texture (and because they go so well with honey) – a handful of toasted pine nuts. To finish, a scattering of sea salt flakes, to cut through some of the sweetness. So yes, this recipe is really simple – in fact, I made it without an ice cream maker, mixing the gelato base every 20 minutes or so to ensure it would freeze evenly and the ice crystals would remain small. After about 1.5-2h (our freezer does freeze incredibly fast), the gelato was pretty thick, which is when I added the honey swirl. 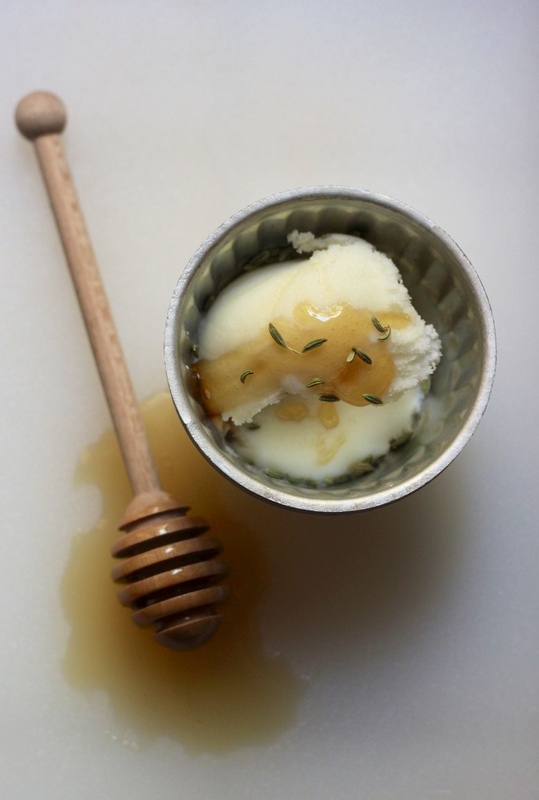 You could also just freeze the fior di latte gelato base semifreddo-style in a loaf pan, cut off slices and serve the fennel-infused honey and pine nuts on the side so everyone can pour some honey over their gelato themselves. A grown-up sundae as you will (and you know how much I love those). Having bought more ripe peaches than even I can consume before they succumb to this heat wave, I am thinking this gelato will work wonders on top of a wholemeal peach galette. 1. Start by heating the cream and the sugar on a small flame until the sugar is dissolved. Add the milk and the pinch of salt and whisk to combine. Set aside until the mixture has reached room temperature. 2. If using an ice cream maker, churn gelato according to the manufacturer’s instructions, stopping just before the gelato is ready (the consistency you are looking for is that of a thick custard – the gelato is thick but still soft enough to be easily stirred). If you don’t have an ice cream maker, pour the gelato base into a freezer-safe container with a lid and place into the freezer. Every 30 minutes or so, remove the container from the freezer and whisk the gelato base with a wire whisk (this helps to ensure that the ice crystals will be small, uniform and evenly distributed in the gelato). Return to the freezer. Repeat whisking every 30 minutes or so for about 2.5 to 3h depending on how cold your freezer is (again, the consistency you are looking for is that of thick custard). 3. While you wait for the gelato to reach the right consistency, toast the fennel seeds and pine nuts in a dry pan on medium heat until the fennel is fragrant and the pine nuts are golden brown (this will take ca. 5-10 minutes). Add the honey and a pinch of sea salt flakes and stir to combine. 4. 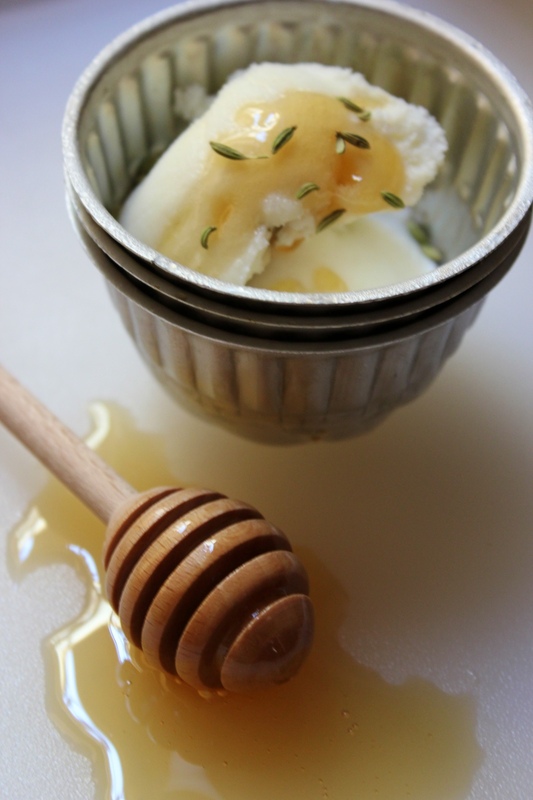 Once the gelato has reached the right consistency, drop spoonfuls of the fennel-infused honey through the funnel of your ice cream maker if using one, otherwise drop spoonfuls of honey onto the gelato base and, using a spoon, try to distribute the honey evenly (without however blending the honey completely into the gelato). If using an ice cream maker, pour the gelato in a freezer-safe container and place in the freezer. Otherwise, simply return the gelato container to the freezer. Please note that you will need to remove the gelato from the freezer ca. 15 minutes before you want to eat it as it freezes quite hard. This is beautiful! And I love the flavor combos! This is absolutely stunning! I adore fior di latte ice cream and would always order it as a child on holiday in Italy (along with chocolate and baci which may well have masked the taste but I loved all three!). 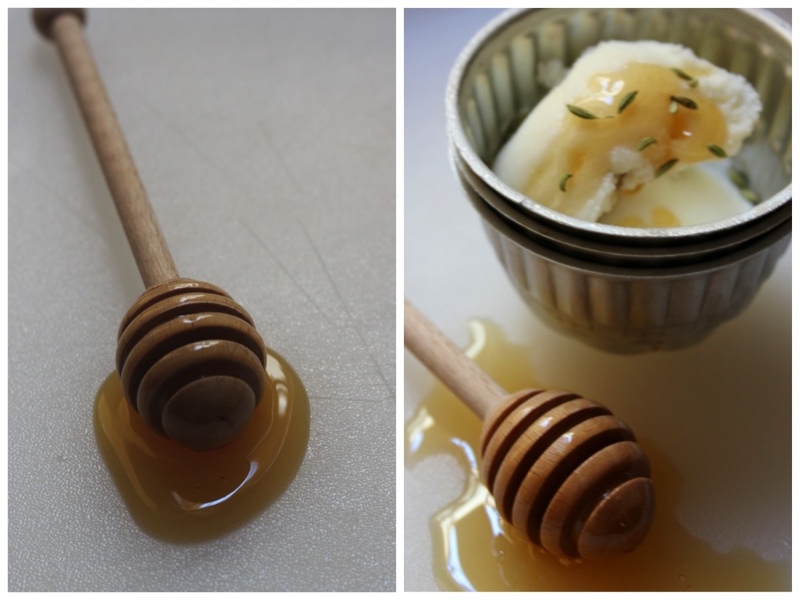 The addition of fennel and honey is so sophisticated – gorgeous. I love and don’t spend much time on thinking how they would go together but it is nice to have a bowl of ice cream where all the flavours go together really well for a change!